TC Mag reports ThermalTake introduced three modular (450W, 550W, 650W) and four standard (430W, 530W, 730W, 730W) Smart Series power supplies. The modular models have an 80Plus Bronze certification (up to 88% efficiency) while the non-modular units are 80Plus rated (up to 86% efficiency) but all feature ATX 12V V2.3 compliance, active PFC, a single 12V rail, a quiet, 140mm fan, a MTBF of over 100,000 hours, and circuitry providing over current, over voltage, under voltage, over power, and short-circuit protection. 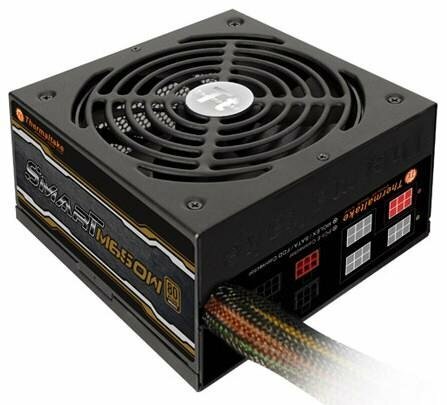 The Smart Series PSUs are backed by a three-year warranty and have already started to hit stores. For now, only the modular units are available, priced at about €50 (450W), €52 (550W) and €62 (650W).